Are you a Reiki professional who wants to expand your practice so you can help more people with Reiki? I've been a Reiki professional since 1986, and in this video, I share four ways you can connect with new prospective clients. Your video was helpful. I have started a Facebook page and participated in a wellness event that has brought me to practicing Reiki with a an autistic child. It is not about the money but how can I help people. I hope to reach out to more children going forward and offer my services to them. I will continue to collaborate with people and my hope is to volunteer in a hospital or nursing home or other patient facilities. Also to further my education in other ways of helping people in need. Its so nice to hear from you. You are such a good wellwisher for others..May you be blessed with unlimited abundance in all areas of life, may you grow spiritually unlimitedly. a useful starting discussion. especially the tip about not rushing to charge. Yes Pamela, this video clip was helpful. The part that was most useful to me is your suggestion of affiliating with and being helpful to like minded organizations. All of this reflects how Reiki enhances the giver as well as the receiver. I continue to be inspired by you, and your clear, direct approach. I intend to explore some local organizations and how there may be some mutual benefits. Very helpful, commonsense tips…basically start where you are…. your ideas are simple but make good sense. Thank you. I am a Reiki II practitioner and will be moving to a new state in a few months. Your support and guidance is so valuable! Thank you so much for providing this kind of support. I find that not being quite a new practitioner but having one or two clients who pay, this has been enormously reassuring and I do so appreciate your free video offerings as I have been investing steeply in my education and sometimes its really the reassurance from a mentor more than anything that I require. So thank you very much. My site is not active as I am not ready to offer Reiki sessions to the public. I am building and decorating the rooms where I will introduce and offer Reiki sessions. Hopefully it will be ready to open in September 2016. As soon as I can use the rooms, I will invite the professionals in my area, fysiotherapeut, hairdresser, dentist, nurses and others who interact with people. These are professions where I plan to send clients who need more specialized treatment than we will be offering. I plan to invite the professionals to my location and introduce them to the treatments that will be offered, all well in advance of the official opening. They will be offered to come back for a free Reiki session before the date of the opening. That way I will build my confidence and be ready to open my doors to the public when I finally have the necessarry licences I need from the local guvernment. As I am rebuilding a old barn into a Energy and Wellnes center, I need approval of the local guvernment to change the use of the building. As long as I dont take any payment, I can still give Reiki session as a private person on my private premises, but once I start taking payment, the paperwork must be in order. Thank you for sharing of your wisdom ! Irene, why not start connecting with professionals in your area now? Once they know you, they are more likely to come to your event. Good luck with your plan! I have to complete 100 treatments for my Reiki program, so I asked my minister to introduce me to people that she knows who run domestic violence shelters and who counsel sexual assault survivors. I offer Reiki to their clients at no charge. It helps the people who receive the Reiki to feel better, and I can get the practice and experience that I need to finish my training. Having the minister’s “seal of approval” opened some doors that I hadn’t been able to get through by myself. Very good strategy, Jena. And I love that your program requires 100 Reiki treatments. I have just received my Reiki Level 2, and have only my family to practice on at this time. I love your suggestions on maybe connecting with a yoga, massage school to offer free Reiki to gain experience and confidence. This was very helpful. Thank you, I look forward to your other videos! Thank you Pam. According to you sharing Reiki should be very simple and when one ponders what you say it really is. The Reiki I practice so far has been on close friends or relatives who are open to it, or simply have no suspicions about Reiki having connections with the occult. If I am honest my inhibitions probably arise from the latter or more importantly some people who may feel it is not congruent with their faith. Thank you Pamela. At this point as a newbie, I appreciate the loving and spiritual essence of the practice in which it should take place. I am using friends and family members to practice Reiki on, as well as self Reiki. Locally, there is a wonderful supportive group of Reiki practitioners who get together and I am amazed at the level of peacefulness and collaborative existence in the setting. What resonated for me was the way you suggested we approach a professional practice….steeped in our own practice, and practice on others with mindful follow up to reinforce our conviction about the beneficial effects of Reiki treatments on others. Your words and very down to earth suggestions about when it is the right time to ask for money for our services were very reassuring. I felt that, “Yes, I can do this, and do it in my own time.” There is no rush after all. Thank you Pamela for all you do. This video was excellent! Happy to be able to support you following your comfort, Jana. I think we can only do things in our own time. Thank you for that video, it’s very encouraging. I think I started the right way, giving friends Reiki at no charge. My best friend in Germany, where I am from, has started with Reiki since I had given her a Reiki session on one of my visits. She was so lucky to find a group where they meet once a month. I think that might help too, exchanging ideas and experiences. I am a Hospice Home Aide and I know that some hospitals in Chester County and even my company where I work for, have volunteers giving Reiki. Looking forward to increase my knowledge, thanks again! Thank you Pamela for this great idea to share your experience with Reiki practitioners. I have been practicing Reiki since 2004, at first assisting my teacher who used to have clinic, then volunteering in different Reiki teams working with older people and so on. Then we had group of 5 Reiki enthusiasts who dreamed about healing center and we started to work and charge little money at senior center. Later with my colleague we started small Reiki center together where we offer sessions, teach classes and have practice nights for our students. We also offer monthly low cost clinic having in mind new clients who want to try Reiki for lower price. Nevertheless, finding clients is still an issue. For example, I work as a volunteer in Cancer Center with staff and patients and can say that we had only 2 students and zero clients from there in 8 years. Our center exists almost 3 years and I found that not many people are ready to refer their friends even so they themselves come back again and again. Not many people are ready even to leave review. On the other hand, this year we see more people coming from internet where we have website, FB page, accounts on Yelp, Google, Bing and almost everywhere. So from my experience, internet is more effective way to introduce our business to prosperous clients but it takes time to get results. It is very interesting to find out your recommendations. Hi Pamela, finally getting to your videos, good to hear this again and a gentle reminder to get become more active. i have just joined a local business network, which I will approach to talk about Reiki in the future. That’s a great idea, Alan. Let me know how it goes. Pamela MIles, thank you for these helpful tips. I like approaching potential clients or referral sources from the stand point of offering something helpful. It takes the selling pressure off everyone and allows for good communication. You’re welcome, Mary. Good communication is the basis of good relationship. If we don’t have that, how can we expect others to hire us to offer them treatment? Thank you for these FREE videos. You are helping many Reiki practitioners, including myself. I’ve met many people who say, “Oh yes, I know Reiki. I learned Reiki, but I no longer practice it.” Your support is keeping many of us from saying the same thing. THANK YOU! What do you think about “sliding scale payment plan” and/or “pay what you can” payment plan? 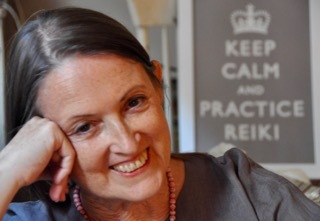 Lani, the most important things about Reiki fee policies are that they are clearly articulated, so that the practitioner and the client have the same understanding about the fee before the session is booked, and that the Reiki professional feels comfortable, that he/she is satisfied that her expertise and practice have been appropriately compensated. If you offer sliding scale, reconsider your policy, or the lower limit, if you find yourself feeling resentful. Thank you for sharing what has helped you. I like the idea about connecting with community centers and helping them therefore connecting more thoroughly with needs of the community. We all know healing is reciprical.It is amazing how little people know about energy and how vital it is to health. I am beginning to build my practice in another state and I so appreciate your tips. My existing practice was easier to build as I already had a base clientele to begin with. Thank you Pamela for sharing. Thank you. I am a Reiki Professional also. I have a busy personal practice, as well as teaching, and I offer 14 Practitioners trained with me a space to offer their services as well. I agree with Relationship Marketing. My intent is never to sell or get clients. My intent is always to connect with people and establish relationships. I am always happy to educate and be of Service. My practice is in total Integrity with the Reiki Healing Principles (and me) and is based on Love, Integrity and Service. It is the first Reiki Center in my area and I know it continues to be successful because it is Professional and Grounded. I never speak to someone with the intention of making him/her my client; my intention is always to serve the practice, and the person I am speaking to. I refer most people to the professionals I’ve trained. Helping them build their practice is part of my responsibility as their teacher. Many thanks Pamela for generosity and sharing all great ideas and inspiration. You pushed the button of inspiration in me and I very appreciate your help. Hi Pamela, the volume is too soft on my computer on the 1st 2 videos and the sub titles make for a few giggles! Blessings, Lynn. Did you turn up the volume on video itself, not just your computer? You can see the icon in the lower left side after you start the video. Some great ideas. It is difficult with Reiki to market it as the two things seem at opposite sides of the spectrum! Amanda, I have heard people say that before, but let’s think it through. Marketing is communicating, letting people know what Reiki practice is and how it can help them. When people express an interest, then marketing becomes relationship-building. Aren’t communicating and building relationship part of a professional Reiki practice? Perhaps you’ve been turned off by sleazy marketing. We all have. And we don’t have to do that. We can communicate with honesty and sincerity, modeling the benefits of Reiki practice so that people hear what we are saying and see what a Reiki “product” — someone who values the practice enough to practice self Reiki every day — looks like. Yes, thank you Pamela. It is that sleazy marketing image of sell, sell, sell, that makes me cower away from trying to market my services, also because Reiki is not a tangible product it can be difficult to win trust in others, but you are right, being a role model for how Reiki can benefit is in itself a wonderful marketing strategy! Thank you for this opportunity. I have been a Riki practioner for many years. I did attempt to develop a business but it did not happen. I did use it myself and for family. I volunteer in a facility that offers several types of living for seniors. They have started a morning of chair reiki once a week. Those that come are most enthusiastic. Now I have become more interested. This may lead to something? Thevideos will be helpful. Thank you Pamela! I just met with a colleage today and we are starting a local network. Looks like we are growing in the right direction. We had an idea to make a list of local Reiki professionals and their area of expertise and distribute them to health food stores, Chiropractors, hospice, the hospital etc. Thanks for all of this information. That’s a great idea, Teresa! Why not invite local Reiki practitioners to meet at an informal get together? Thank you for this first video. You have confirmed everything that I really new inside and points I have already put into operation. Volunteering in a hospice as a Reiki practitioner has been the most rewarding thing I have done since my first attunement in 2002. It has given me the confidence to help others and from their feedback no that all is worth while and I am worth paying. Giving a class in January after a long break from teaching. Thank you Pamela Miles. I became a practioner 10 years ago. Since then I haven’t had much opportunity to practice, so I loved the comment you made about clients not paying for treatment. This would be great for me because I would have plenty of clients with different reasons for treatment and different energies to work with. Do you practice daily self Reiki, Tina? That’s a good idea for anyone, but especially important for those who offer treatment to others. Thanks so much for your timely video, Pamela. I am actively building my professional Reiki business after relaxing for five years. I agree that reaching out to current and past clients and students for referrals is a great idea. I also network with yoga studios; I’ve discovered that non-corporate owned studios tend to be more open to offering Reiki workshops. I also agree that collaboration is ideal. I’ve found it’s effective to offer a free introductory Reiki session so my potential Reiki client can experience first hand how a session feels. We usually chat for 15-30 minutes about what’s going on in their life. As I listen I’m able to connect the benefit Reiki might offer them and share from my personal and professional experience with Reiki practice. This process creates a warm, sharing atmosphere. This naturally flows to the person receiving a Reiki session. After the session we discuss what was noticed. I always invite the person to schedule a professional session before they leave. Thanks for all you do, Pamela! Thank you for your kind words, Paula. Regarding free intro sessions, if that works for you, great, but it’s good for practitioners to make a very conscious choice here. If we give something for free, it’s best that it be something we can actually give freely. Otherwise it won’t work. I prefer to give free brief samples as part of introductory programs given to groups. People can feel the difference a few moments of Reiki touch makes, and I can research the audience’s needs in advance (if it is a particular group, such as people with a specific medical condition or people who are in the same industry) or I can ask questions at the presentation to make it relevant. This is one of many choices we need to make for ourselves, and revisit. What works now might not be so comfortable down the line. If we stay current with ourselves, we can keep adjusting our approach to fit who we are now and what our schedules are like. I really enjoyed your video and, in particular, your advice of working collaboratively with others who employ similar modalities to healing. I too, am not ready to offer service- for- fee, even though I practice daily and am committed to doing so. Until I am ready, it will be my pets and friends who will have to do. And I am sure your friends and pets appreciate your care, Grace! When you are ready to stretch a little, you can ask a friend to refer someone so you start having the experience of giving sessions to people you don’t know, who have only come to you for treatment. Plan your offer carefully. You might plan an initial session in which you meet each other and he/she receives a treatment/meets Reiki practice. Then, if both of you are comfortable continuing, three more sessions over an agreed period of time (perhaps four days – two weeks), with a statement of what the client notices in terms of benefits. Meanwhile keep a professional prep journal which is not about the clients, but about what you are experiencing, especially any place in the interaction where you feel unsure, so you can get mentoring and gradually improve your confidence and clients skills, which are distinct from Reiki practice. Thank you so much for all the advice ???? ?it was wonderful and I know there are a lot of people suffering so thank you for your wonderful guidance Angel blessings ????? Elaine, I completely agree with you on the importance of not charging a fee until you feel that you have adequately prepared yourself to be a Reiki professional. You might want to scroll up to a long reply I left to Susan discussing that. Meanwhile, you are still speaking about Reiki practice and wanting to tell more people about it, whether or not you give them treatment, or charge for your treatments, so I think the information will be useful for you and help you build your confidence. Thank you Pamela for your excellent sharing. For quite some time, I have considered an online presence. My son has encouraged me with his own experiences. So far, I have been reluctant! I like your idea of starting with a Facebook page. It seems more ” user friendly”. I plan to try that soon. Nancy, A Facebook page is so much easier to set up than a website. You can likely do it yourself. It’s a business page that you start from your personal profile, but you can keep them outwardly totally separate if you want. And there is no charge for the page itself. Good luck with it! Thanks for doing these videos and sharing your advice, Pamela! I liked the suggestion to ask existing clients for referrals if you have a good relationship with them and feel comfortable doing so — something I never thought of doing, but it makes so much sense. Looking forward to learning more as this series continues! I had been thinking about creating a healing network in southern Maine, but put it on a back burner. Thank you for reminding me of that! You also made me think of going to the Senior Center to offer to give a talk about Reiki there. I have already left my card at a local cancer treatment center that opened in the next town over about six months ago, and hope to hear from their volunteer coordinator soon. Thanks for this video, Pam. You’ve come up with a number of good opportunities, Karen. Good luck with them! Why wait to hear from the volunteer coordinator? Why not follow-up and reach out to her? I was going to-no email address on her business card! Will all her Monday. ? What a nice video with a nice approach!! Thank you so much. I do agree with you to offer free sessions until one gains more experiences and confidence. I volunteered at various places including hospitals and military facility every week for about 3 years before I started charging. These experiences were very precious. I also love the idea to collaborate with other professionals in the local community. To me, the approach to “reach out, collaborate, and help” is more important and meaningful than just “focus on gaining clients. Thank you! Several great thoughts. The most valuable idea for me is to start connecting with other professionals (massage therapists, chiropractors etc.) in the area as space is hard to come by and is expensive unless you can see clients at your home. Thank you Pamela, I am just starting my practice after moving to a new community. I spent the last three years studying with my teacher in Ann Arbor and so while finding a new community to grow into, these tips are quite helpful! I have built a website and am trying to find new friends to practice with here so I can begin to build a community before charging people. That part of your site really resonated with me, to wait until you feel grounded enough to be confident in creating an exchange that feels equal. I am excited to start my practice here and look forward to your future videos and suggestions! Dear Pamela, thank you so much for this helpful video series, it is very kind of you. I like the ideas of connecting with healing concerns, yoga studios, holistic healing centers. Center did not promote, encourage our individual practices. Do you see this as a concern? I do. people value more what they pay for. My thoughts, I respect that you feel otherwise. Thank you for your comment, Susan. I mentor my students in moving gradually into becoming a Reiki professional. It’s important that professionals-in-development have a strong foundation of daily self practice, and sufficient experience offering treatment that they are confident enough to simply place hands without trying to make something happen. When Reiki practitioners lack conviction in their practice, they are at risk (more likely to breach boundaries and bleed their own vitality) and are unlikely to have the poise to be able to support clients. For those reasons, I encourage Reiki practitioners to appreciate that they are getting value from opportunities to offer treatment before they are professionals, and to think of that transition time as an internship in which they are developing the professional skills that enable them to charge fees. The invaluable experience they are gaining is payment enough. Of course it’s fine to ask the person receiving the treatment to cover any costs involved, such as babysitting or space rental. I don’t see a problem with telling a potential client that you are in training and contracting to do X number of treatments without charge, at which time the agreement would be reviewed and a proposal made that is based on where the practitioner is at in her development. It’s important that clients understand the level of professional experience a practitioner offers so they can adjust their expectations and make an informed choice. We avoid a lot of problems when agreements are made clear and reviewed. Building a network with like minded professionals in my area is a great tip. Thank you for offering this video series…it all resonated with me. The more I avail myself of your wisdom the more I realize just what an invaluable resource you are to all of us who are involved with Reiki. I’m excited to see what comes next. Much gratitude to you. Very Good! The main thing is Reiki Works! With the high cost of healthcare today one performs a valuable service. This especially true for deserving elders in need of relief. They are excellent clients as they readily feel the difference even at small levels. Our Aging Society will come to accept this with welcoming gratitude as it is practiced! The Pioneers of this alternative form of healthcare are to be praised. Working together great things are accomplished…….. Thank you for this helpful series of videos that you are sharing. It is most appreciated. You are very welcome, Marianne — I’m happy to help! Thanks so much for the invitation to view this series of videos. This video is timely as I am about to join an existing practice that offers massage, naturopathic and osteopathic services. I was wondering how best to develop the collaborative relationship — thanks for the great ideas! This is a great video, thank you Pamela! I have taken a break with my private practice, but this really feels like a good springboard to get back in business. I will let my old clients I am back and available, but probably the most useful ideas today to help me move forward are creating a network and approach professionals I know within my community. They really go well hand in hand! Looking forward to watching the next video! I just listen twice to the first video it is brilliant so very helpful . Step by step good solid advice to start building my practice upon. The most useful tip for me was approaching professional that I already know for collaboration by offering my help and see where it goes from there. Thank you Pamela. The video was very informative. The advice that I found most important is to start small, create a network, and to coIlaborate . I am currently a Reiki volunteer in a hospital that provides complimentary Reiki treatments to both patients and staff. Many of the volunteers have had many requests from clients about continuing their treatments after they are discharged. Ideally I would like to help create a Reiki community/clinic where all the patients have an opportunity to continue receiving Reiki treatments after their discharge. I heard some suggestions that I have used in the past successfully. I have moved to a new area so am starting over with new clients. Your reminders were most helpful. Good luck building your new business! Thank you !! I love how you are soft spoken and share ideas for new clients. Sharing I want to help was a great way of expressing what we do, surround yourself with positive, healing energy! Pamela you are amazing! Thank you ? Thank you, Patricia! So happy you find the video useful.